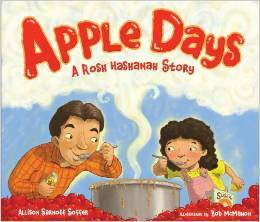 Every year Katy and her mom go apple picking before Rosh Hashanah. They carefully pick enough apples to make delicious apple sauce for their family’s celebration. At the last minute, her mom gets a call from Katy’s aunt. Katy’s new baby cousin is coming early and her mom won’t be able to go apple picking this year. Katy is very disappointed and tells each friend and neighbor she sees. The next day, she is surprised as each of those friends and neighbors hands her an apple as consolation. Might Katy still end up with enough apples to make her special apple sauce anyway? This is a sweet little story about the power of community. The story is geared toward young children (ages 2-7), but the message can be appreciated by any age. Small acts of kindness in response to a disappointment make a big difference for one child. Bob McMahon’s illustrations are brightly colored and lively. The cartoon-like style that he uses will appeal most to younger children. The story could also be told rather than read. It would likely take a little adaptation to make it work from the voice of a storyteller, but there is so much potential for a good telling of this gentle little tale. Religious educators could have some serious fun with the apple sauce recipe in the back. For congregations outside of the Jewish tradition, this little book could be an opportunity to engage in a bit of respectful interfaith education – a very needed thing in our world.